My friends and I have started a tradition of sending each other gift boxes twice a year - once for the winter holidays and again in the summer when we have birthdays spanning from May through September. The theme is 'favorite things' and they all have to be the same and cost no more than $25 each. With the five of us spread out all across the country, it's become a way to share our interests and do something fun together. For our summer exchange, we were lucky enough to be able to meet up in Palm Springs, which I described here as four blissful days of poolside relaxation. My friends gifted us lotions, face masks, water floaties, and even a pair of bikini bottoms! For my contribution, I wanted to be able to make something (my favorite thing, of course!). I knew that for it to work it had to be quick, fit a range of bodies, and cost less than $25. With these constraints in mind, I decided upon lounge shirts, using the Colette Sorbetto pattern and knit fabrics. The fun part was the fabric shopping. I found such great prints online that I made each shirt themed. I chose a bright bird print for my friend who loves nature and hiking, an alphabet print for my friend who's an elementary school teacher, and even a ninja-themed print after my friend's online screen name. I rarely have an excuse to go all out with whimsical prints, so I took full advantage! I sourced the fabrics on Fabric.com, and for two of the prints I shelled out the extra money for some Art Galley Fabrics. I tend to hear a lot about this brand, mostly because they send fabric samples to a lot of bloggers to review. They have beautiful prints, but I'd never actually sewn with the stuff. Because knit fabrics vary so much, I was curious how they hold up in real life. The verdict? They were pretty great! They were thick and buttery, and sewed nicely. I think they had better recovery than the other cotton knit I bought, and seemed more substantial. I steamed some of my wavy seams, and was very pleased with how the AGF fabric held up. I could see myself using this for knit tops instead of paper-thin jersey, as it sews so much better. The only problem I had is that one of my prints had a small ink blot on it that looked like it had accidentally been marked by a ballpoint pen. Unfortunately I didn't notice this until after, and it ended up front and center! Oops! I'll let it slide this time, but will report back if I notice anything again. My friends were very gracious gift recipients, and some even lounged around in them all weekend if we could be bothered to get dressed at all. It's hard to get real feedback on how things go (and really, would you even want an honest critique? ), but it was fun and the shirts themselves only took a day to make up. I only wish I had made one for myself! So fun! 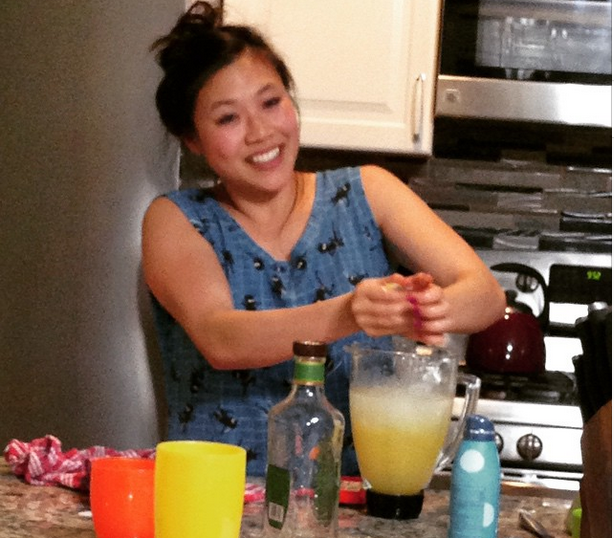 Your friend is beautiful (and those margaritas look good too)! These look good. What lucky friends. That's such a nice tradition, and great shirts! 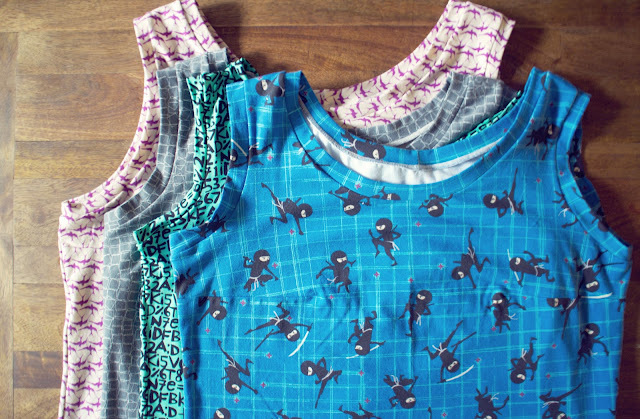 I just made a baby sleep set from the same ninja knit, I found it great to work with too. So cute and what a great tradition!! How fun! And what a great gift! I have only ever made gift garments with knits-- it's just easier to know they'll probably fit! And you chose such fun knits!